Donald Trump thinks he’s going to carry Pennsylvania. Democrats in Pennsylvania think of the state as a Blue State. Republicans think of it as Purple. The Republicans are correct. Although Pennsylvania tends to “lean Democratic,” Republicans can and have won the state. The last time a presidential election ended up with Pennsylvania’s electoral votes in the Republican column was in 1988 – George H.W. Bush against a weak Michael Dukakis. Any Pennsylvanian who is 28 or younger today might assume that the state always votes Democratic. Don’t be so sure. Looking at the six presidential elections since, the Democrat/Republican split in the Pennsylvania vote is far closer than we’d think. No Republican has won Pennsylvania in these contests, but the margin of victory is as little as 150,000 votes. Pennsylvania is about to be swamped with political ads, robocalls, door knockers, and blog posts (like this one), because the state would be an absolute plum for the Trumpers and a must-win for Clinton. …The Democrats…for whatever reason, stayed home in 2010. The Republicans didn’t. The Democrats can usually count on winning the cities – Philadelphia, Pittsburgh, Erie, and perhaps Scranton, while the Republicans are left with all of the rest. The quote attributed to James Carville, “Pennsylvania is Philadelphia and Pittsburgh with Alabama in between,” is not far off. Pennsyltucky. Journalist Tom Ferrick wrote an excellent breakdown of just how Trump could (but probably won’t) win Pennsylvania. Whichever party controls the State General Assembly in the beginning of a decade (a la 2010) gets to redraw Congressional districts. The Republicans swept into office in the 2010 elections were the ones who got to control who gets to vote in which district, thereby ensuring their own re-election in years to come and keeping Democratic voters to a majority in as few districts as possible. This PDF map shows the pure art form that is Republican district mapping. 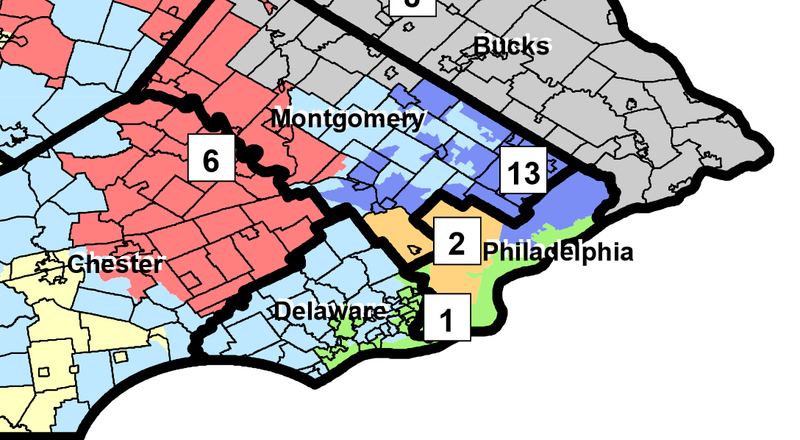 Take special note of the districts around the major urban areas of Pittsburgh and Philadelphia. This accounts for the fact that Pennsylvania’s contingent to the U. S. House of Representatives is made up of only 5 Democrats but 13 Republicans, despite being a majority Democratic state. The fix is in, and will be for many years to come. Unless the Democratic Party can reclaim the General Assembly by 2020 (improbable), the Republicans will continue to control the state government for at least another decade. The Sixth District (above) is a work of art. Spans four counties to ensure a majority Republican vote for the next several centuries. If you don’t know whether you are eligible to vote in Pennsylvania, click here for the Pennsylvania Department of State’s Voter Registration services. It’s quick and easy. Here are the results from Pennsylvania over the last six presidential contests compared to national votes. Bill Clinton won his 1992 race, but benefitted in large part from the insurgent campaign of Ross Perot. George H.W. Bush might easily have won re-election but for Perot. In 1996, Clinton increased his vote total, while the Republican total remained flat. Insurgent voters seem to have cooled on Perot, with perhaps some of them ending up in Clinton’s column. Still, Clinton was re-elected easily. The 2000 election was the one that went all the way to the Supreme Court. While Al Gore did compile a larger number of national votes, the all-important Electoral vote came down to the state of Florida (hanging chads). Whoever won this last state would win the presidency. Having endured the questionable 2000 election and the questionable invasion of Iraq, suddenly over 20,000,000 more voters came out of the woodwork for the 2004 race. Even so, the results were very close in the total of votes. Notice also that W won both times with a narrow victory in electoral votes. The miracle of Obama’s first campaign was in getting millions more voters registered and getting them to the polls. Note that the Republican votes are down 2,000,000, while the Democrats total was UP by over 10,000,000. In 2012, Obama suffered voter disaffection, largely because of the historic Republican obstruction in Congress and the blowout Republican wins in the 2010 midterm elections. Even so, he was able to overcome a Romney challenge – but note how close the vote totals were. Even though Republicans were generally dissatisfied with Mitt Romney, they turned out in large numbers to pull the Republican lever. More dry numbers: As of the 2012 presidential election, Pennsylvania had 9,910,224 citizens of voting age. Of those, 8,508,015 were registered to vote (a healthy percentage), yet only 5,753,670 of us actually turned out. I SUSPECT (and I have no data to back this up) that a large portion of the unaffiliated are disaffected Republicans (like myself) who left the party because of recent events. This would be BEFORE the campaign of Donald Trump. So if they were disaffected before, they should be even more so now. Donald Trump has managed to offend and antagonize virtually all groups of people except undereducated, older, white men. Yes, there are the exceptions that prove the rule, but by and large his base is what it is. The Democrats, seeing this, are fashioning an even larger tent to include Republicans unwilling to vote for Trump. More and more top-level Republicans are indicating that they may, just this once, vote for a Democrat, rather than allow Trump to embarrass us all for the next four years. I would suggest that this is exactly the way to go. How redistricting turned America from blue to red. ​The Republican Party (i.e. : the people who run the party) are about to try “putting lipstick on a pig,” if I can borrow from Half-Governor Palin. Throughout the convention and the 3½ months until November, they are going to try their hardest to get you to forget the entire last year. They will succeed with a large portion of Americans, whose collective memory is at best two months and those who will vote Republican no matter what. WE remember. WE don’t forget. If your impression of Donald Trump is that he is a pig, a xenophobe, a misogynist, a racist, a fraud, a liar, a pig (did I say pig? ), ignorant of the U.S. Constitution and federal laws and treaties, a cheat, a deadbeat, and on and on, you are correct. From the day he descended the escalator into the realm of politics, he declared himself a bigot. With his very announcement speech (Mexicans, rapists, and some of them, I’m sure, are good), he rang a bell that the Pale Skin Militia could hear 3,000 miles away. Since then, he has managed to target one segment of the population after another, with the exception of stupid, older, white men (of which, ironically, I am one) and all who believe that a lack of melanin somehow conveys an innate biological superiority. These men have no scruples, no honor, no self-respect, no dignity. And these are the men who want to choose as your next president the unstomachable Donald Trump. This article (by Chris Kirk, Ian Prasad Philbrick, and Gabriel Roth at Slate.com) lists a STAGGERING number of missteps made by Trump over the last year. A mere 10 years ago, any one of these might have forced him out of the race. Today, all of these are absolutely acceptable to Republicans, as they now work their asses off to get this man into the White House. And now the Party People think they can wrangle Trump, bend him to their will, and make him a much more appealing candidate for the general election. As disgusted as they’ve been, as #neverTrump as they’ve been, as humiliated as they’ve been, it’s all in the past and their one goal now is to DEFEAT HILLARY CLINTON. These men have no scruples, no honor, no self-respect, no dignity. And these are the men who want to choose as your next president the unstomachable Donald Trump. The guy with the tiny hands. When you see Trump looking down and reading his speech, he’s reading the words that his handlers have written out for him. When he uses a teleprompter, he’s reading prepared text not his own. When he goes off script and begins to extemporize, his handlers cringe and we can all look forward to yet another newsworthy verbal faux pas that offends a whole lot of folks. His chosen vice presidential candidate was not a Trump pick. Pence was put forward by the Party People in a deal for their support of Trump. Trump didn’t pick Pence, Trump doesn’t even like Pence. Trump’s introduction of his new “partner” showed that about as clearly as possible. The King of the Deal got outdealt by the political hacks. But Trump doesn’t give an orange crap about who the VP candidate is, since that’s outside of the scope of his attention – himself. VP is irrelevant. Trump is All. This might all just work. When I see a poll that says that more Americans think Trump is more “honest” or “trustworthy” than Clinton, I know that I’ve given the American public too much credit. The fact-checkers (the people who check “facts”) rate Hillary the MOST truthful of all 20 candidates, far above “Lyin’ Donald” (also above Bernie, but that’s no longer relevant). The Republicans have spent 25 years painting Hillary as the Devil Incarnate, and it seems to have stuck with the majority of idiots – I mean, Americans. There are “articles” and videos all over the internet proclaiming Hillary to be a liar, an incompetent, ineffective, even a murderer. And yet, even after 128 Congressional inquiries and investigations, she’s still walking around free. And it drives them crazy. With every Republican attack, Hillary just gets stronger. Hillary Hulk. Christian evangelists are voting for Trump, because they’re completely screwed up to begin with. These Christian evangelists are neither Christian nor evangelists. They are hate-filled radicals who cheer every insult of “others” and readily believe that Trump’s favorite book actually is The Bible, a book he’s never read (or owned, probably, before it was brought to his attention that he should oughta maybe have one). Every time he talks about how religious he is and always has been, he embarrasses himself. It is obvious how NOT religious he is. The good news is that Christian evangelicals are not the major religious voting bloc. That award goes to the Unaffiliated (atheists, agnostics, people who choose not to pick one religion out of many). And the Unaffiliated are leaning heavily Democratic. While Christians profess to believe in an ancient alien (by definition) who hates all things Democratic, more and more are coming to see that that’s a whole lotta garbage that they can live without and that we all have more in common than we thought. Gun worshippers think voting Trump is the way to go. May be, since he really doesn’t care about that, either, while the Democrats want sensical, popular restrictions. They love their guns above all else. Any side-eye is enough to get them riled up, as if the jack-booted thugs are comin’ to git their guns! I’m convinced that the gun worshippers, as a class, are among the stupidest, low-information voters there are. We’re all agreed that universal background checks should be routine, but if you try to pass that law, even the gun worshippers who SUPPORT that start screaming about chipping away at their 2nd Amendment rights and hug their guns even tighter. WHEN we come to take away their guns (uh-huh), we should start with those who insist on Open Carry. Open Carry means that I can wear a holster, like in the Wild West, or sling a long gun over my shoulder while wearing my paramilitary gear or camo and go grocery shopping. But let’s think about this… Why would anyone want to carry a firearm out in the open in public? 2) They’re looking for an excuse to use it. If you’re not afraid, you don’t need to walk around with a gun. But, just like drawing a sword, if you carry it, you better be ready to use it. And look forward to it. If there’s another reason, I don’t know it. But our collective insanity over guns is a topic for another day. Economic conservatives are voting for Trump, thinking that he’s the answer to our sluggish economy. Yes, the man who exemplifies the flow of all money to the top is the very man who’s going to solve the problem of income inequality. In a lipstick-covered pig’s eye. He has no real plan (other than everything’s going to be great) and he’ll be surrounded by the same Republicans who’ve sabotaged the U.S. economy for the last 16 years. So what’s going to change? “He’s a great businessman.” He’s great at declaring bankruptcy, extracting millions for himself, and leaving thousands of workers holding an empty bag. This is the very picture of Wall Street greed that even rank-and-file Republicans are supposed to despise, but now they’ve nominated him as their candidate. Crazy. Sentients will not be voting for Trump. Women will not be voting for Trump. Aside from his piggishness (and tiny hands), Trump is not exactly an advocate for women’s causes. His new running mate is exactly OPPOSED to women’s causes. The Democratic candidate, on the other hand, has long been a voice for women, at home and around the globe. Hillary Clinton is famously a warrior for women’s health, education, workplace respect and dignity, and, of course, pay equity. Educated people are not voting for Trump. Apparently, the least little bit of higher education imparts enough sense to avoid political candidates like Trump. Even college-educated white men are leaning Democratic. It’s obvious that colleges are teaching reading skills and, maybe, How to Use The Google 101. Minorities are not voting for Trump. With only the rare exception, people of color are smarter than to vote for a man who has flat-out insulted them, threatened them, denigrated them. A recent poll showed that Trump’s share of black voters in Ohio and Pennsylvania was 0%. That’s a zero. Okay, it was rounded DOWN to zero, but that’s still really close to zero. (Psst – the very concept of zero came from the Arabic peoples, by the way.) Minorities are not just knee-jerk Democrats, they are among the most discerning of voters, fully aware of issues that matter to them, and they know full well that today’s Republicans are actively attacking them. This is what it comes down to – the largest bloc of voters for Trump are “working class” (read: no college) Caucasian men over a certain age. That’s the one reliable group that he can count on, and that’s the group that all of his attention has been on for the past year. He had them from “Mexican rapists,” so he really should have spent his time courting other demographics. His loss. But he gets the Klan, obviously, and all of the right-fringe radicals hiding throughout the 50 states, waiting for the White Nation to rise again. Notice now how often these fringe elements are beginning to come out into the daylight. The Trump candidacy emboldens them. David Duke chose NOW to run for the Senate from Louisiana. No coincidence. But it is not enough to win the election and install Hillary Clinton in the Oval Office. That’s just asking for another 8 years of obstruction, hate, threats. We need the proverbial landslide – the STATEMENT election that says, “Crawl back under your rock.” The message has to be loud and clear that we will not tolerate racism, xenophobia, or misogyny in our politicians. We will not tolerate this from the people who support such politicians. The message has to be loud and clear that we will not tolerate racism, xenophobia, or misogyny in our politicians. And we need to take back the Senate (well within reach) and as many seats in the House as we can manage. We need to reclaim State houses, so the Republican-gerrymandered districts can be redrawn (this one is much harder; the damage was done in 2010 and may take decades to undo). The Republicans have cheated their way into a large majority in State Houses across the nation. They’ve passed hundreds and hundreds of anti-abortion bills across the country, ruined state budgets by giving tax breaks and subsidies to corporations and the wealthy, while simultaneously attacking our very right to vote. They are determined to hold onto power, despite being a minority party. If every eligible Democratic voter would vote twice each year for the next four years, we could put an end to a lot of the Republican nonsense. That’s all it would take. Ten minutes of your time, twice each year, for the next four years. DO IT.